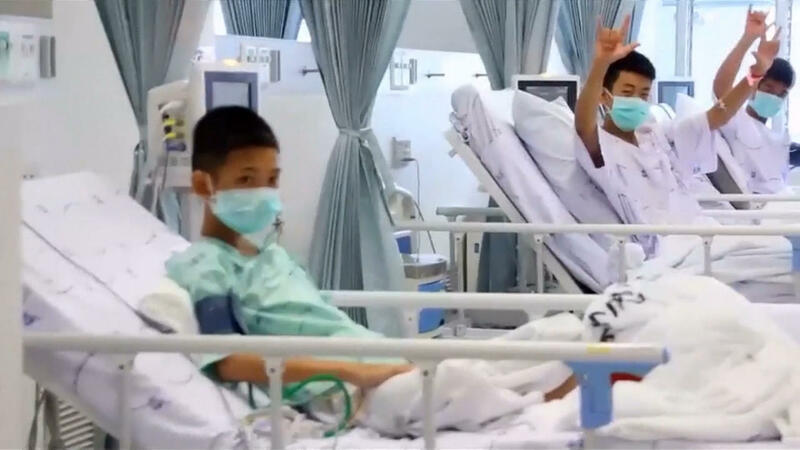 The Thai hospital where the 12 boys and their soccer coach are recuperating after being rescued from a flooded cave has released video showing them in their hospital beds, smiling and chatting with nurses.The video shows the boys in an isolation ward in beds with crisp white sheets and wearing green surgical masks. Chaiwetch Thanapaisal, director of Chiang Rai Prachanukroh Hospital, told a news conference involving officials involved in the rescue that "everyone is strong in mind and heart." A Thai health official said earlier Wednesday that the soccer teammates had lost weight during their two-week ordeal, but had water while they were trapped and remained in good health. Thongchai Lertwilairatanapong, a public health inspector, said Wednesday the 12 boys and coach rescued over the three previous days "took care of themselves well in the cave." Thongchai said one member of the final group of four boys and the coach who arrived at a hospital Tuesday evening had a slight lung infection. Another new video clip to emerge on Wednesday came from the Thai Navy SEAL team which led the rescue effort, showing them pulling at least one of the boys through the cave on a stretcher, heavily sedated.